HRTV did a piece on Evening Attire on their show Inside Information. Click the link below to watch. EVENING ATTIRE HONORED WITH OWN RACE! The Aqueduct Handicap has been re-named the Evening Attire, in honor of the 2002 Aqueduct Handicap winner who retired in 2008 at the age of 10, and will be run on Saturday, January 17 on the inner dirt track. The $65,000-added race is for three-year-olds and up at a mile and a sixteenth. Evening Attire will spend his retirement close to all his NY fans. Evening will head to Akindal Farm in Pawling NY. Akindale is well known for their efforts to rescue thoroughbreds and provide a great home for them. I can't think of a much better place for Evening to go. IF YOU CAN AFFORD TO BET ON A HORSE, YOU CAN AFFORD TO GIVE. AKINDALE THOROUGHBRED RESCUE DOES A GREAT JOB OF SAVING HORSES. ANY AMOUNT OF MONEY YOU CAN GIVE WILL HELP OUT A HORSE. PLEASE VISIT THEIR WEB SITE AND MAKE A DONATION IF YOU CAN. THANK YOU! Click here to view pictures from Evening Attire Day. The brown horse is Lisa B, who is a half sister to Evening Attire. She is a 3 year old filly who will be racing soon. Show your support for Evening Attire! Evening Attire, who was on the board in 40 of his 69 starts, has been retired from racing according to Hall of Fame trainer Tom Kelly. Tom Kelly bred and owned Evening Attire with his partners Mary and Joe Grant. Attire was first trained by Tom’s son Tim Kelly and later by Pat Kelly. Evening Attire won 9 stakes races and placed in 12 more, earning almost 3 million dollars . His first graded win came in the Discovery beating Street Cry at odds of 65 to 1. At four he won the Jockey Club Gold Cup. 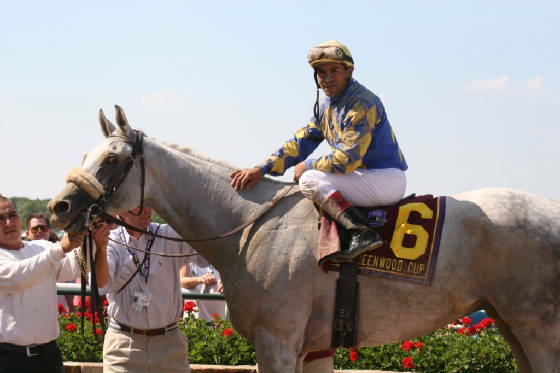 In his last race, as a ten year old, he won the mile and half Greenwood Cup at Philadelphia Park setting a track record and earning him a place in the Breeders Cup Marathon. Attire ran in the Breeders Cup Classic twice and has competed against most of the best horses in the country over the last eight years, including Street Cry, Balto Star, Lido Palace, Macho Uno, Medaglia d'Oro, Volponi, Perfect Drift and Funny Cide. Where Attire will retire has not been finalized. All options and suggestions are being considered by his owners. If any horse deserves to have his own web site, it's Evening Attire. For 8 years he has delighted his fans with his willingness to take on all comers and battle them to the very end. While he may not always win, he always gives 100%. This web site is for fans old and new and includes a recap of all of his races, where he has raced, his personal best in many different categories, pictures and video. I hope you enjoy it! IN A RACE THAT WILL NOT SOON BE FORGOTTEN, THE BRAVE 10 YEAR OLD GELDING EVENING ATTIRE HAS WON THE $250,000 GREENWOOD CUP AT PHILADELPHIA PARK BY 8 1/4 LENGTHS, WILL SETTING THE TRACK RECORD FOR THE DISTANCE OF 1 1/2 MILES IN 2:29.90. THE RACE WAS A BREEDERS CUP WIN AND YOUR IN RACE, AND AS A RESULT, EVENING ATTIRE IS NOW ELIGIBLE FOR THE BREEDERS CUP MARATHON. Winning Owner: Grant, Mary and Joseph and Kelly, Thomas J. Below is a comment form. Please contact me and let me know about the web site. I am interested in any ideas to make it better, anything else you would like to see added, and please point out any errors. Thank you.